*No elevation chart today because Zedenek accidentally took a different route much of the day when he did the trail. *Creative title credit goes to E tonight! Another grand day today! I really am going to have to find a wider vocabulary to describe the awesomeness we are experiencing so I don’t sound like a broken record on this trail. The day started off with me waking at 6:30am and attempting to get some blog stuff done. With our later endings and wet nights, I’ve been falling asleep without finishing entries, gasp! I finished up the last two, but it took longer than anticipated. Then I had some technical difficulties. There wasn’t wifi at the hostel, but I found the magic spot where I got enough bars of service to load the entries slowly. E was super patient and we left an hour later than I would have liked. E enjoys hiking later and it still stays light til 10pm up here, so we knew we had time. What we weren’t sure about was if the weather would let us play today…The forecast was for rain and thunderstorms and we had a pass we wanted to get over later in the day. 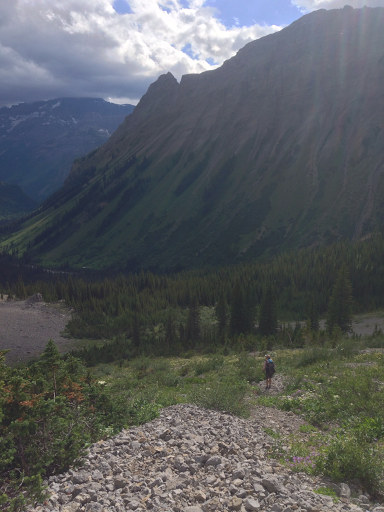 This leg to Banff is only three nights, and the last two nights we have reserved campsites we need to hit. To do that without having to pull out a really long day the second day, we needed to get over a pass today. Not advisable in a thunderstorm, so we set out hoping for the best, but expecting the worst so we wouldn’t be disappointed. This leg is supposed to be on of the most spectacular with views and sights around every corner. With rain a possibility much of the week, we hope our luck continues and we still get to see everything. After leaving late and getting a late hitch, it was almost noon when we strayed hiking. Our goal endpoint was about 17mi in, which isn’t ideal, but we knew it would be light late if needed. As we left the trailhead, we notice a backpacker lounging at the road. We asked if he was a GDTer and he said he was doing sections this summer and waiting for someone in his family to join him in this next section. 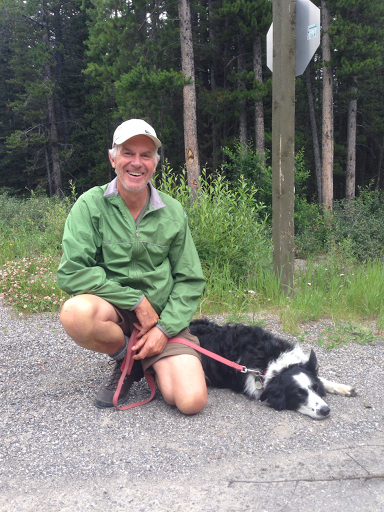 His name was Horst and he hiked with his dog Ace. It was fun to meet someone else that had done some of what we had. 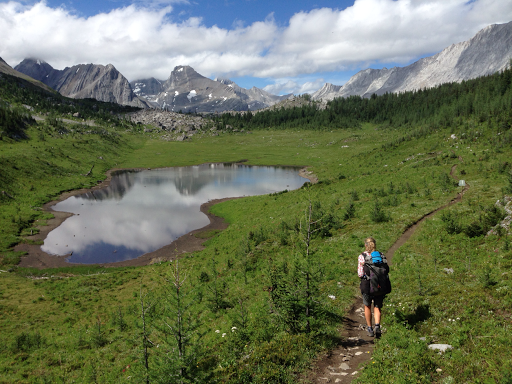 We started off with a nice, smooth, scenic, and relaxing hike along Upper Kananaskis Lake for almost an hour. It was great! 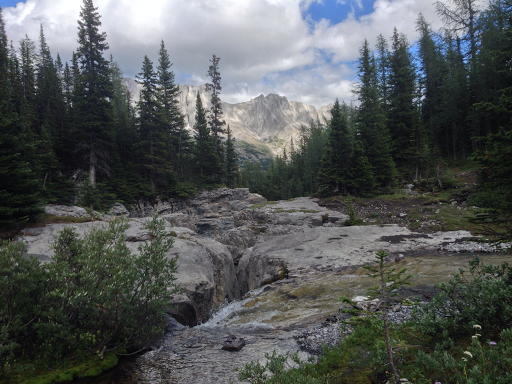 Today was mostly in the Peter Lougheed Provincial Park and it was very well maintained with clear wide trails and nice campsites. I was really impressed by it. 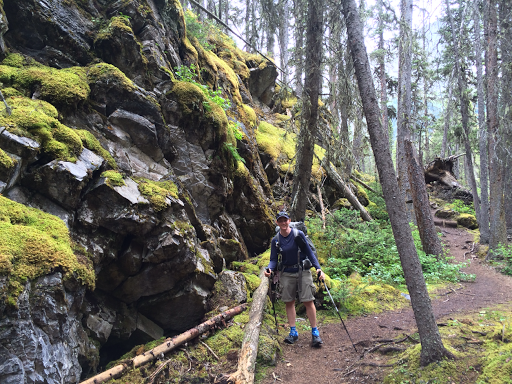 The trail meandered through mossy forests that I loved and over newly built bridges. 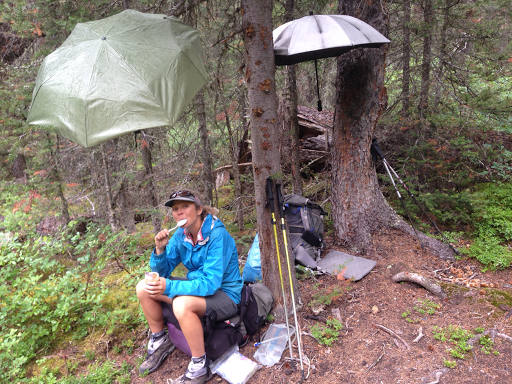 It rained on and off for short periods and we stopped for lunch while it was raining at one point. E (who got a new umbrella in the village) had the best idea of propping the umbrella in the tree above her so she didn’t have to hold it while she ate. Genius! It worked perfectly since it was a light rain. After lunch, we passes Forks Campsite, which is a very nice spot I’d recommend. Looking back as we hiked away from it, we could see the impressive Mt Lyautey and its glacier. It may be my favorite so far. It’s amazing how unique all the mountians are from one another. Lyautey had cool vertical layers that reminded me of a Fossil watch. Today was spectacular with the immensity of the mountains we saw and there was not way to capture the grandeur by photo. It all felt so large and impressive in person and seem so small in the photos. Just keep that in mind with all the photos today. Luckily, the rain held and we had perfect puffy clouds to add to the enormity of the mountains. Really, we couldn’t have asked for a better day! We celebrated hiking in dry shoes and socks for the first time in awhile. We went by Turbine Canyon where there is a short side trial to see a spot where people straddle the canyon. Neither of us were brave/dumb enough to try. It was wide! 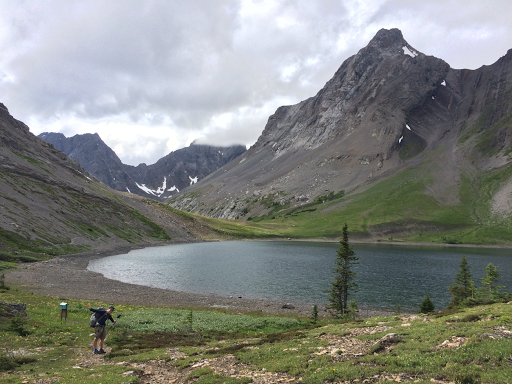 The climb up to N Kananaskis Pass was less exposed than we anticipated, so the threat of foul weather made hiking speed less emergent. At the top was Maude Lake and that was great too. All just perfect! The wildflowers were great too. 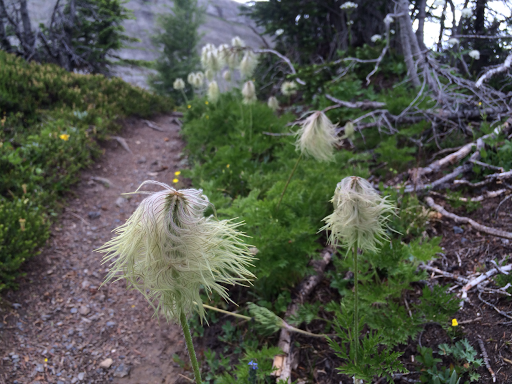 E really likes the Dr Suess bed head looking ones and got this great shot of some. 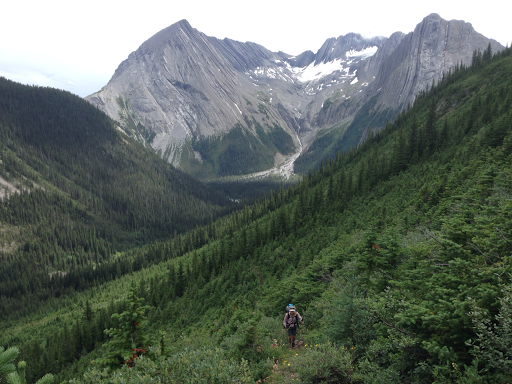 Once over the pass, it was a whole other world as we entered Height of the Rockies Provincial Park. The steep, rocky trail down has thankfully been cut back a bit, but was still brushy as we got further down. We were paralleling the silty LeRoy Creek on the way down, so we got water from a spring partway down and kept eyes out for camping. We crossed the multi-branched LeRoy and had fun adding rocks and logs to an already partial log crossing, but both managed to get a bit of wet feet, dang! It was 7pm and we were open to camping…IF we could have found anything in the dense brush. 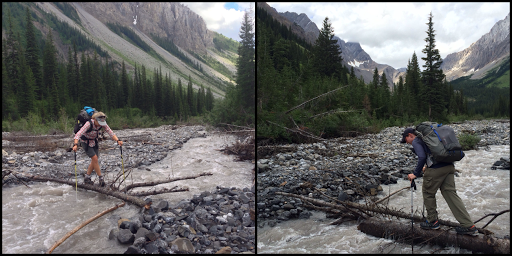 We ended up going all the way down to the Palliser River crossing, which had fallen trees we could easily cross over. It ended up not mattering because we then hit a very overgrown forest and meadow area that had a lot of water in the brush and got our shoes wet. So much for a day with dry feet. We looked for awhile and stopped at 8pm when we realized our best option was a wet grassy meadow. It was the buggiest night yet with more gnats than mosquitoes. 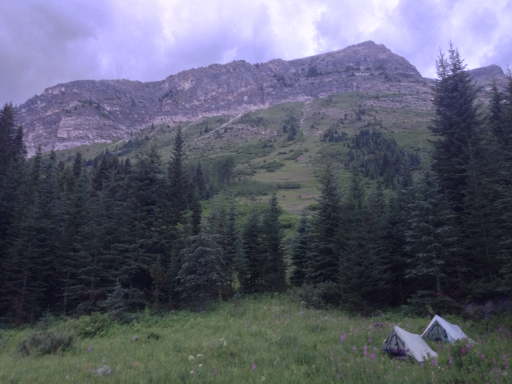 We were done with dinner and chores and getting in the tents around 9:30pm when the rain came over the mountain. Perfect timing and it put me to sleep immediately. I had to finish this post the next day. Whew, another great day on the GDT!